The huge château dominates this interesting hillside town on the banks of the Loire, good to use as a base for visits throughout the region. 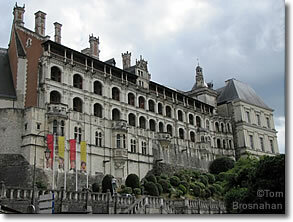 The Château Royal de Blois dominates the town of Blois, which climbs a steep hillside above the banks of the Loire (map). The stone pont Jacques Gabriel bridge crosses the Loire from the city center on the north bank at place de la Résistance to Blois-Sud on the south bank. Here's information on getting to Blois by train, bus and car.